After some early morning losses, oil markets turned around yesterday despite a bearish oil market report showing net builds in oil products. Crude oil this morning is currently $51.47, down 84 cents from yesterday’s close. Fuel prices are down this morning with diesel trading at $1.8685, down 2.6 cents. Gasoline is also trading lower this morning with prices at $1.3924, down 2.4 cents. The EIA released their weekly numbers yesterday, which was generally bearish for oil given the overall build in stocks, though the larger-than-expected crude draw helped give prices a boost. Gasoline stocks continue swelling higher, keeping downward price pressure on the product – in the Gulf Coast (PADD 3), gasoline stocks have risen to all-time highs! Diesel inventories, on the other hand, are still well below their levels this time last year despite rising by 20 million barrels over the past four weeks. 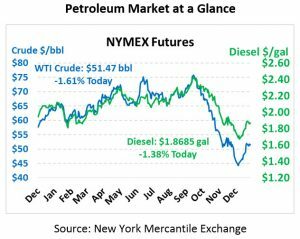 In yesterday’s FUELSnews we shared the EIA’s article noting that diesel crack spreads, the price difference between a gallon of crude and a gallon of diesel, would reach 65 cents per gallon in 2020, a whopping 20 cent increase from current prices. 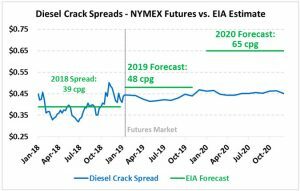 Current NYMEX futures suggest a 45 cent crack spread in 2020 – well below the EIA’s estimate. The EIA tends to be fairly conservative, so their prediction is particularly interesting given its incongruence with current market futures. The EIA tends to take a very conservative approach to forecasting, extrapolating directly from futures markets. However, their forecast of 65 cpg diesel crack spreads indicates that the market is about 20 cents lower today than it ought to be. 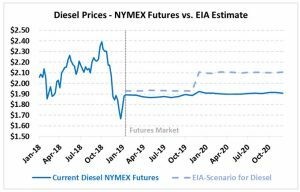 If you agree with the EIA’s analysis, then 2020 NYMEX diesel prices (the price a consumer could lock in as a fixed price) ought to be roughly $2.10; instead, that price is currently trading at $1.90. 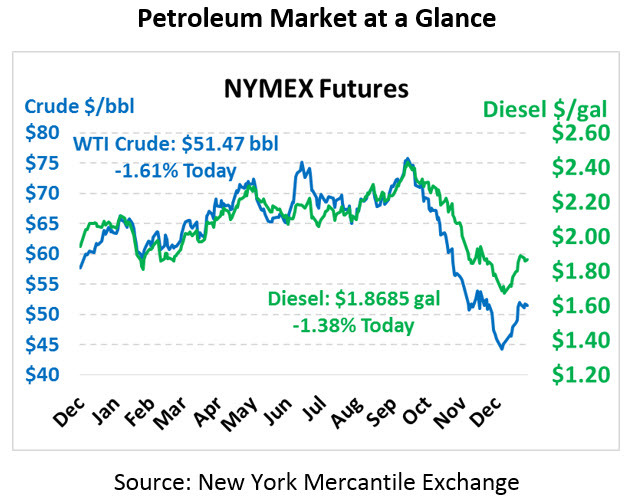 According to the EIA, even if crude oil stay flat at $50, diesel prices will rise heading into 2020. For consumers, this represents a significant opportunity to consider price risk management for the coming year.